Stacey Blake, the woman behind the popular interior design blog, Design Addict Mom, knows a thing or two about color. The mother of two has created a cozy, colorful home for her two boys in North Carolina. Featuring vibrant hues that range from pale blue to deep pink, this design mom embraces color with confidence. Throughout every room the color story of pastels and saturated hues makes this home a truly special environment. 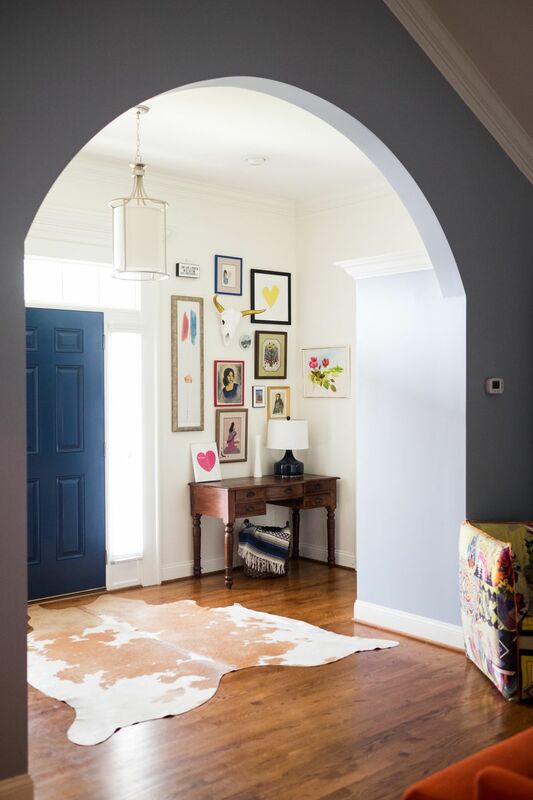 The home's light-filled entryway offers a preview of the color splash, with bold, beautiful art on display. Blake's green thumb is on display throughout the interior. Located in North Carolina, surrounded by green, Blake has brought the outdoors in at home. Plants thrive in this light-filled space. Cacti, palms, and a giant fiddle leaf fig dominate this family room. Stacey has many ways to bring color home in her interior. Colorful art, paint and wallpaper are spotted throughout. And colorful furnishings are showcased as well. In the family room, pale blue walls become the perfect neutral backdrop. The furnishings in rust red and fuchsia pop in the space. According to The Cut, Millennial Pink is the 21st century shade that refuses to go away. Pink, no longer seen as a sweet shade, is fast becoming a new neutral. And Blake has mastered how to make this shade work just right in her kitchen. The deep pink wall is complemented by Nana Pink wallpaper by Justina Blakeney. The pink-on-pink action, broken up by shades of teal and green, is perfectly stylish for an interior in 2017. In the living room, a floor-to-ceiling entertainment unit is perfect for a home with small children. Behind the panel, stowed away is the home's television. The storage panels create a unique way to focus on other elements on the bookshelf, most importantly—the books. Extending from the open-plan kitchen, the living room eases into the color blue. A dark, burnt sienna sectional offers another unique color palette that makes this home shine. Stacey loves to use her space as a sounding board for her design ideas. That love of exploration has translated into some fun DIY ideas that are on display in this home. The home office is a one-of-a-kind space. "Although I had to employ a professional electrician, my proudest DIY would be when I transformed a closet into my office. It is one of my favorite spaces in our home and so unexpected!" remarks Blake. In the bedroom, Blake's ingenuity is on display. Wallpaper from Hygge and West is displayed here again as a colorful statement wall. While the wallpaper may be the same, the color of the wall is not. This time, the pattern is complemented by the teal shade on the wall. The saturated hue transforms this bedroom into an absolute oasis. This mom also has a love of art, particularly colorful pieces that showcase her personal heritage. In front of the teal wall, a framed piece of art that was first featured on Terry McMillan's book, Waiting to Exhale, is on display. Surrounded by plants, the vignette is a vibrant display. In the boys' room, primary colors dominate the space. Shades of blue, orange and yellow stand out in the kid-friendly area. The vibrant palette is a shimmering reflection of Blake's two little ones. Blake has also introduced art to her children through a gallery wall just for them. The wall includes homemade art, inspirational quotes, and sculptural pieces that little ones are sure to love, including a mounted cardboard deer. The wallpaper in the boys' room is a giant map of the world. It's truly inspiring for a pair of adventurous boys. The oversized map backdrop creates a wonderful environment for kids to learn and grow. Blake is always ahead of the trend, and her guest bedroom is proof. The dark, moody shade is exactly where bedrooms are going. The saturated shade is a perfect backdrop to the wood furnishings that pop in the space. The final notes of color—a boucherouite rug and beautifully patterned quilt. Color is also featured on the home's deck. The exterior wall has been painted a soft shade of purple. An orange table adds another splash of color. A vibrant mix of plants completes the relaxing outdoor space. This North Carolina home is perfect for Blake and her family. It's a colorful, family-friendly space where creativity thrives.